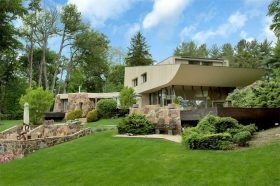 This dramatic, swooping home is the masterwork of Norman Jaffe, an architect known for this “romantic modernist” homes throughout the Hamptons. This stunner is located in Old Westbury, Long Island, at 15 Horseshoe Road. It was built in 1977 and chosen as one of the “best houses in America” in 1979. As Curbed put it, the unique two-story structure is “formed by several hulking volumes” which include a wood-clad, wedge-like roof, a glass-walled living space, and a stone facade and patios. It’s now on the market for $3.995 million.